To accommodate our customers we’ve scheduled the following 2019 butcher dates at our long time processing partner The Butcher Block in Lowell: June 6th June 27th July 18th August 20 th September 12th We also have dates scheduled at Sims Meat Processing, on whom we’ve received great reviews as well. Their scheduled dates are: June 10th July 1 st August 26 Their website is www.simsmeats.com for processing information. We will fill the dates on a first come, first served basis. Please remember that the meat will be ready for pick up about two weeks after the butcher date. When ordering, please specify which location and the date you’d prefer. We currently offer quantities of a whole beef, one half, or one quarter of a beef. Customers place their quantity order with us, and on the specified dates we deliver the animal to one of our processing partners. For years we’ve worked with The Butcher Block in Lowell, IN and recently we’ve started also working with Sims Meat Processing in Kingsbury, IN. Once the beef is butchered, it is then allowed to age for roughly two weeks before the meat is cut. This process is indispensable in helping bring out the flavor and tenderness of the beef. During this time our customers work with our processing partners to choose exactly how they would like their meat processed. Options such as thickness of the steaks, number per package, which roasts are desired and what size, quantity of hamburger in a package, and whether or not to make some of the burger into pre-made patties are just some of the decisions discussed at this time. 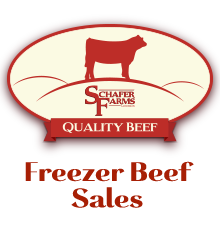 Customers then pay Schafer Farms for the price of the beef, and pay the processing fee to the selected processor. When the meat is frozen and ready, customers pick up the beef from the processing facility. Once it’s home, it’s ready to be enjoyed anytime at the customer’s convenience! We now have a variety of our most popular beef cuts at the farm available for sale! We offer bulk hamburger and patties, as well as all your favorite steaks and roasts. We are open by appointment only, but we are typically available to fill orders 7 days a week. Call or email to check cut availability and current pricing or to place special orders. How much meat can I expect from my order? Every animal is different so weights vary. We sell based on what is referred to as the dressed weight or hanging weight, and an average for our cattle would be about 800 lbs. for a whole beef, 400 for a half, and 200 for a quarter. This is just a point-in-time reference used for pricing. A good rule of thumb would be about 2/3 of this number is what customers will actually take home after cutting and trimming is finished. A 200 lb. quarter should yield about 133 lbs. of beef. What types of cuts do I get? The great part of having meat custom processed is that the customer can decide what they want. Typically 1/4 beef will yield 1 porterhouse steak, 3 sirloin steaks, 6-7 T-bone steaks, 6 rib eyes, 1-2 Swiss steaks, 3 full round steaks, 3 boneless roasts, a few chuck or arm roasts, and the balance would be hamburger. There are also options for brisket, beef ribs, soup bones, stew meat, oxtail, liver, tongue, and heart if the customer desires. (Many choose not to take the organs) We also have customers that only take the steaks and the rest goes to hamburger. It’s totally up to you! How much will it cost? The hanging weight price varies from year to year and is based on the live cattle market at the time. Call or email for current pricing. As a resource for our customers and other beef lovers, we wanted to share a link to a website that Purdue has created with features on safe handling of beef as well as tips on what to do with some great value cuts rather than grinding them into hamburger. Hopefully you find it useful as a way to maximize your dollar and enhance your Schafer Farms Quality Beef experience!